English referee Chris White has stepped down from the International Referee Panel bringing an end to a 12-year stint as one of the world's leading officials. 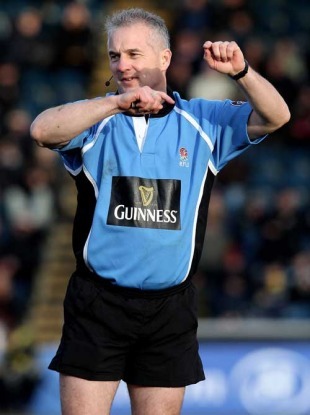 The 47-year-old, a veteran of over 50 Tests, was not included on the IRB's list of international appointments for matches played from June to September 2010, including the Tri Nations, but will continue to be part of the RFU Elite Referee structure. "I'd like to thank Chris White for his superb contribution to the Game on and off the field as a member of the IRB International Referee's Panel over the past decade," commented IRB Referee manager Paddy O'Brien. In addition, the IRB has confirmed the Match Official appointments for the Churchill Cup, the IRB Nations Cup and the IRB Junior World Championship to be played in America, Romania and Argentina respectively during June. The IRB Match Official Selection Committee confirmed the appointments at its meeting in Dublin last weekend after a comprehensive review of international referee, assistant referee and TMO performances following the November internationals and Six Nations. The IRB International Referee Panel includes four new officials in Keith Brown (New Zealand), Andrew Small (England), Chris Pollock (New Zealand) and Jerome Garces (France), who have all graduated from last year's IRB Junior World Championship panel in Japan. Brown and Small will take charge of their first Tier One Test matches when they oversee the June matches between South Africa and Italy at Witbank and East London respectively, while Pollock and Garces will officiate at the Churchill Cup in Colorado and New Jersey. Ireland's Peter Fitzgibbon will kick off the busy period of matches as Australia take on Fiji in Canberra on June 5 with compatriot Alan Lewis taking charge of Wales v South Africa at the Millennium Stadium on the same day. Lewis will also open the Tri Nations in Auckland on July 10 when New Zealand take on defending champions South Africa. "It is very pleasing to see Keith Brown, Andrew Small, Chris Pollock and Jerome Garces join the elite panel this year, having performed so well at the IRB Junior World Championship in Japan last year and also in domestic competition," said O'Brien. "They have impressed the selectors and deserve their reward, and their selection reinforces the role of the development pathway created via the IRB Age Grade Championships." Pascal Gauzere (France) and Peter Allan (Scotland) will return to the IRB Junior World Championship stage in Argentina in June and are joined on the panel by Francisco Pastrana from the host country. JP Doyle and Greg Garner (England), Garratt Williamson (New Zealand) and Jaco Peyper (South Africa) will also officiate at the tournament, now acknowledged as a key stepping stone to the full Test arena. "The IRB is able to appoint from from a strong panel of international referees, assistant referees and TMOs. The volume of fixtures during this busy period also means that we are able to blood the next crop of aspiring Test referees, which is extremely exciting," added O'Brien. Last week O'Brien convened Europe's leading Referee and Referee Managers for a meeting to reiterate global and consistent performance in five key areas of Law. O'Brien will host the same review process for southern hemisphere based referees in July and will host international coaches for a forum in May to ensure understanding and consistency in accordance with directives issued to all Unions in November 2009.